ElderCare Advisors’ mission is to prevent the need for emergency care, hospitalization, and nursing home placement among those most at risk—frail elders, the physically or mentally disabled, the chronically ill and the dying. The HomeCare Planner empowers organizations, professionals, families, and long-term care consumers, regardless of the care receiver’s economic status. The HomeCare Planner offers help to better plan the care, to use available care-funding resources more effectively, and to access community help more readily. For most people, the term “health care” means “doctor”, “hospital”, “surgery”, “drugs”, and “health insurance.” By this definition, America spends more on health care than any country in the world. So why is America’s population so unhealthy? Why do we face a diabetes epidemic, an obesity epidemic, a mental illness epidemic, and a hip fracture “epidemic?” Why does the United States, the richest country in the world, have the 32nd lowest infant mortality rate in the world, and the 45th highest life expectancy. With all we spend, why is the US not the 1st!? Today’s health care system is unbalanced. We work miracles in treating injury and illness, but cannot keep people well to begin with. And perhaps our greatest failing is our inability to prevent unplanned emergency care and hospitalizations, and our dependency on nursing home care for the group most at risk for illness and injury—frail elders, the physically and mentally disabled, the chronically ill and the dying. The HomeCare Planner seeks to rectify this problem by changing America’s health care system to address the needs of those most at risk. The HomeCare Planner broadens the definition of “health care” to include active care-partnering, consumer self reliance, and long-term care planning, not just “inpatient” and “outpatient” treatment. The HomeCare Planner empowers organizations, consumers and professionals to better care for themselves and for one another—no preauthorization required! At ElderCare Advisors, we believe that wellness is attainable, sustainable, and available to all, and that we have the resources we need to create a healthy society. We need only look to ourselves. 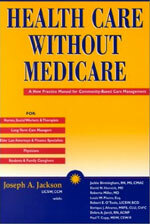 Joseph A. Jackson, MSW (Rutgers University 1984) is founder and President of ElderCare Advisors, Inc., a northeast regional Geriatric Care Management company. Joe is the inventor and and developer of HomeCare Planner’s long-term care decisioning software. For 30 years, Joe has worked in home health care, hospice and care management. In 1997, he founded ElderCare Advisors, Inc., a northeast regional Geriatric Care Management company. Joe is a national business development consultant for health systems and home health care organizations. In 2000, he published the highly praised manual on community-based care management and long-term care planning, Health Care Without Medicare.